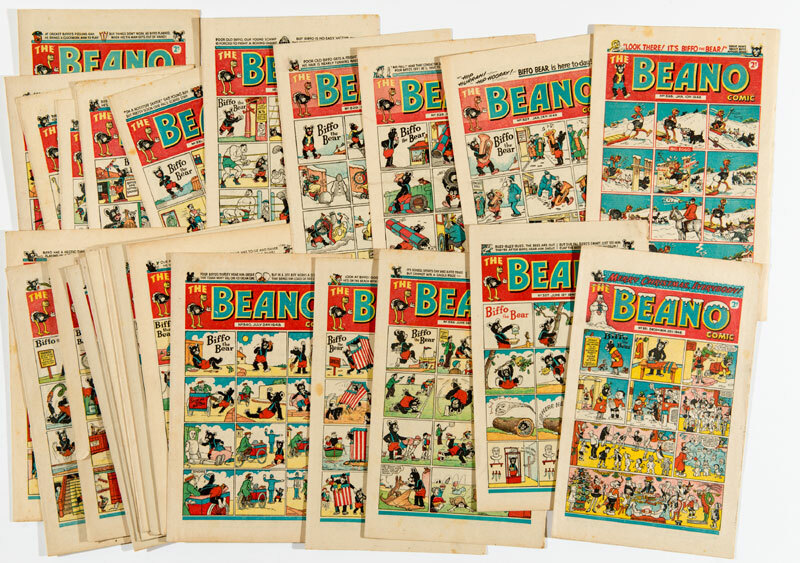 We sold nine early Beano comics between £1200 and £2300 each during our Spring auction. 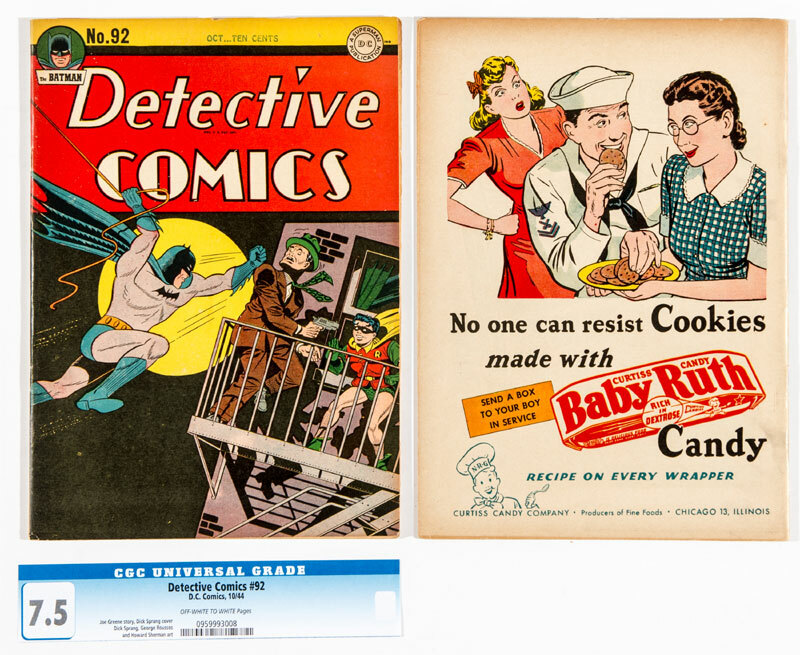 Normally the four-figure territory of trophy No 1 issues, only a handful of these 1938 comics have survived and their condition is particularly fresh in Very Fine grades. With bidders from as far afield as Hong Kong, Singapore, Australia, India and the USA, records were expected to be challenged, but not like this. A new bench mark for British comic values has now been established. 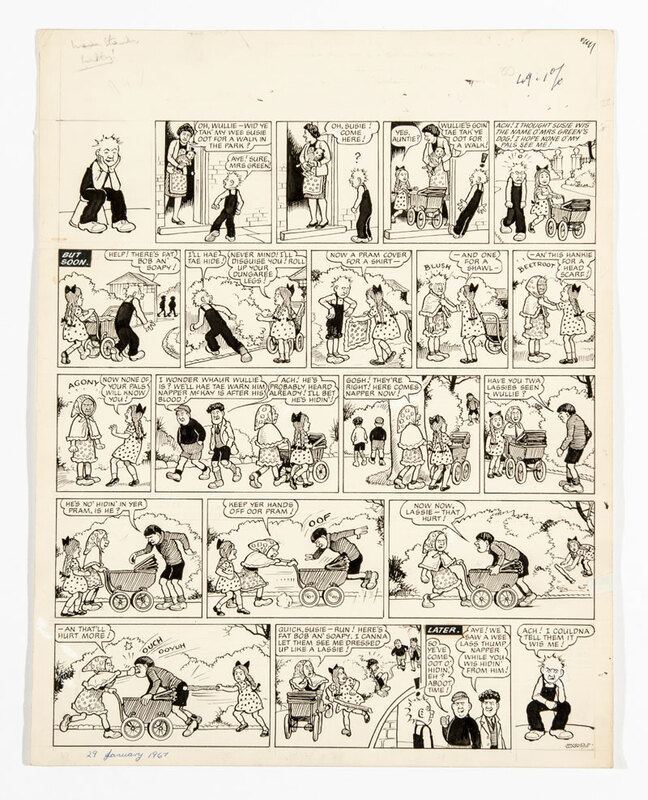 DC Thomson’s lesser known stablemate, Magic Comic was also the beneficiary of record prices as Fine graded issues 2, 3 and 4 garnered £520, £780, and £350 respectively. Magic indeed. 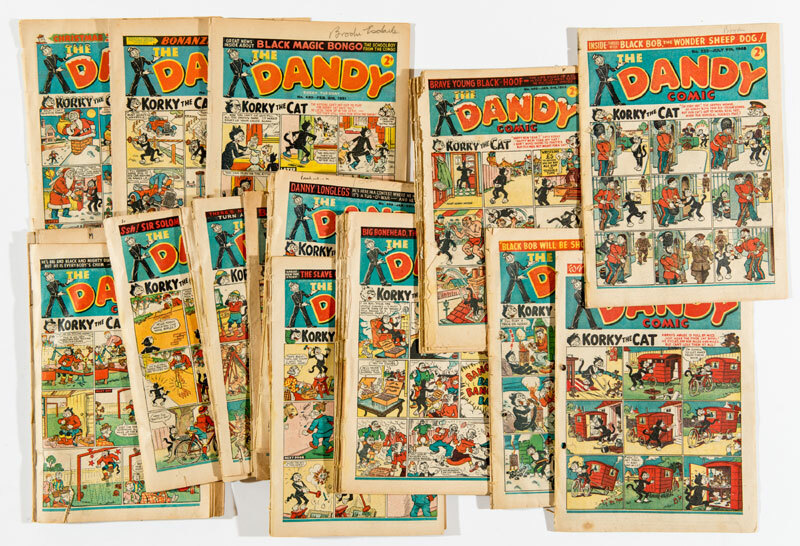 72 rough issues of The Dandy from 1945-51 were retrieved from bound volumes. Some had punch holes and most were trimmed, ruckled and worn. This did not stop the winning bidder from paying £410 or just under £6 each for them. Three propaganda war issues of Beano had implored their young readers to ‘Waste Littler – Paste Hitler!’ in their centre page salvage ads. Thankfully numbers 170, 171 and 172 remained unsalvaged to sell at a whopping £580. There was no waste paper here either as issues 173-175 transformed into £560. 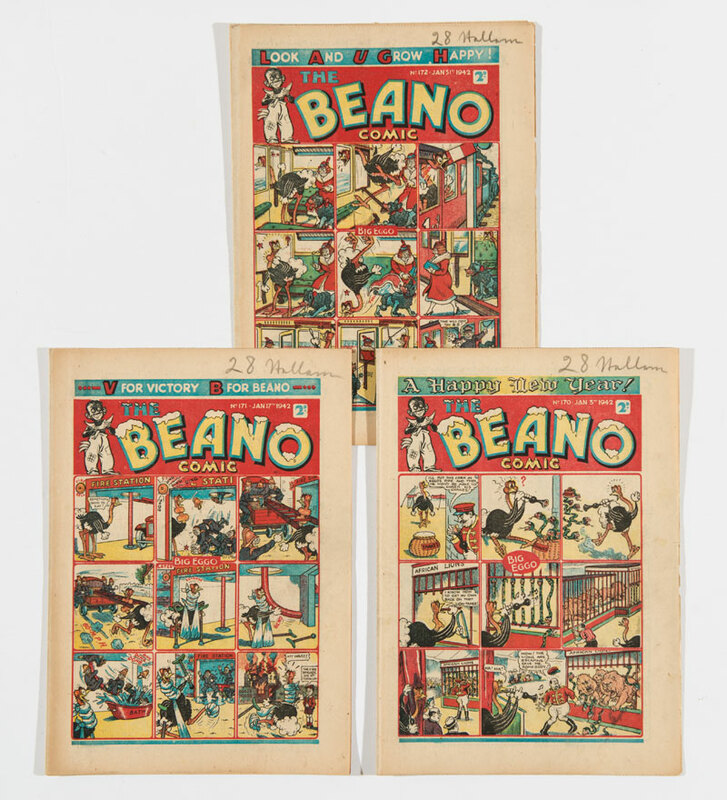 Even post-war Beanos broke records with the complete year of 1948 at a staggering £1640. Paper shortages dictated that issues were printed fortnightly so the 26 fresh copies here ended up at £63 each. Biffo. 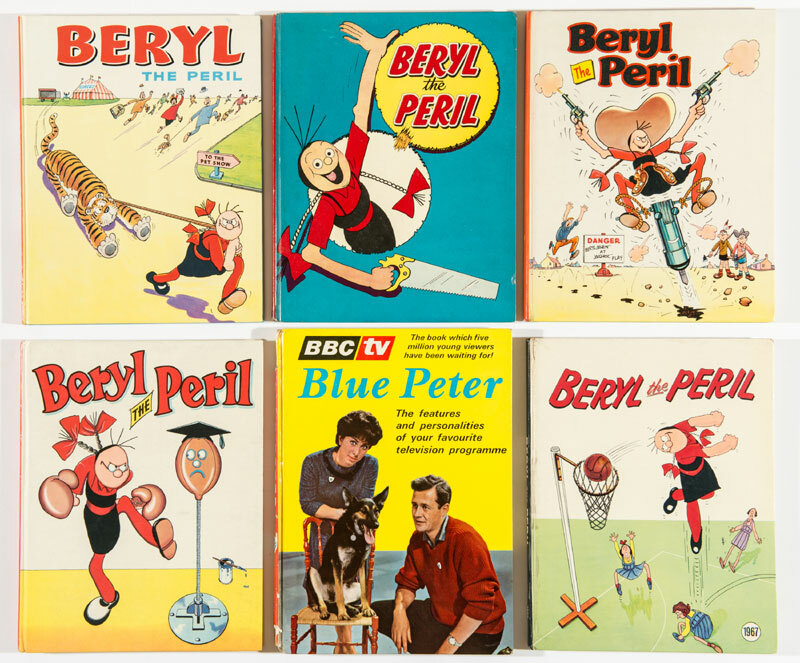 Perilous bidding for the first five of Beryl’s annuals in very fresh condition teamed up with the No 1 Blue Peter annual and found £360. A price they definitely didn’t make earlier. 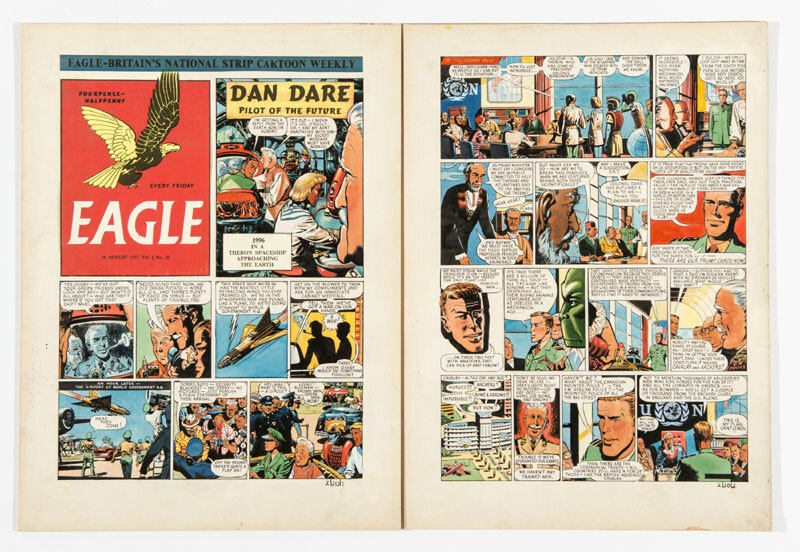 Two early Frank Hampson boards from The Eagle in 1951 were pursued to £1660 showing Col. Dare still hasn’t lost his touch. 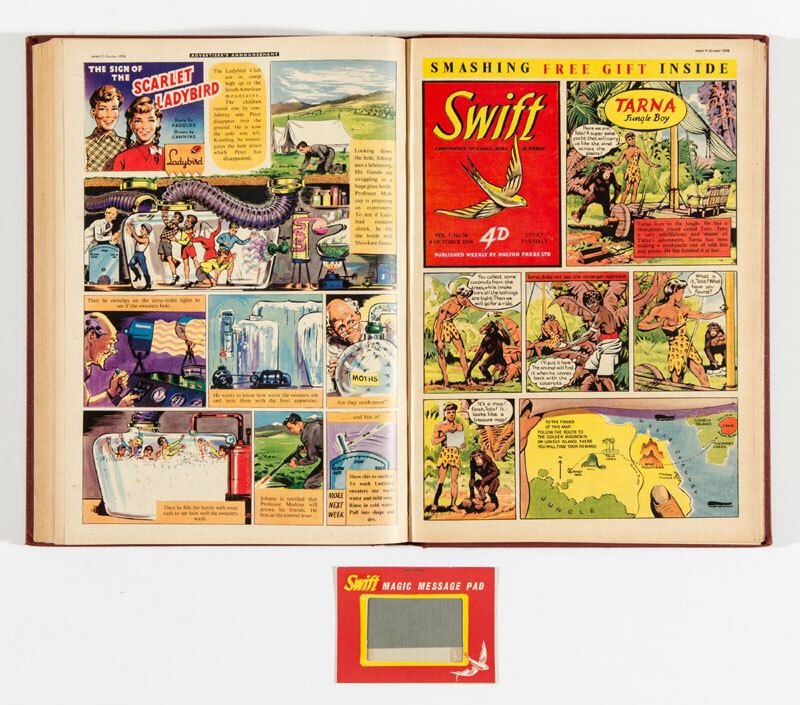 The complete 1-41 bound volume of Swift from 1954 was offered here with free gift Magic Message Pad and made £260. 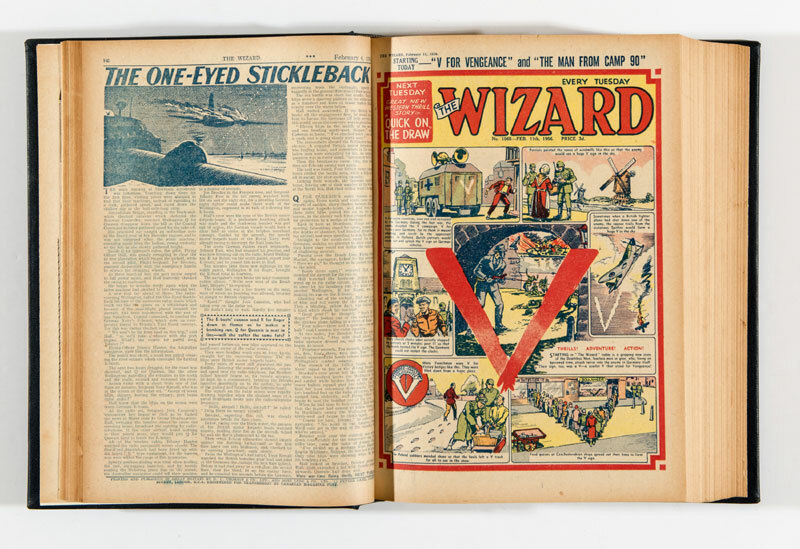 The boys’ story papers have not lost their edge and the 1956 complete year bound volume of Wizard had Wilson winning £270. 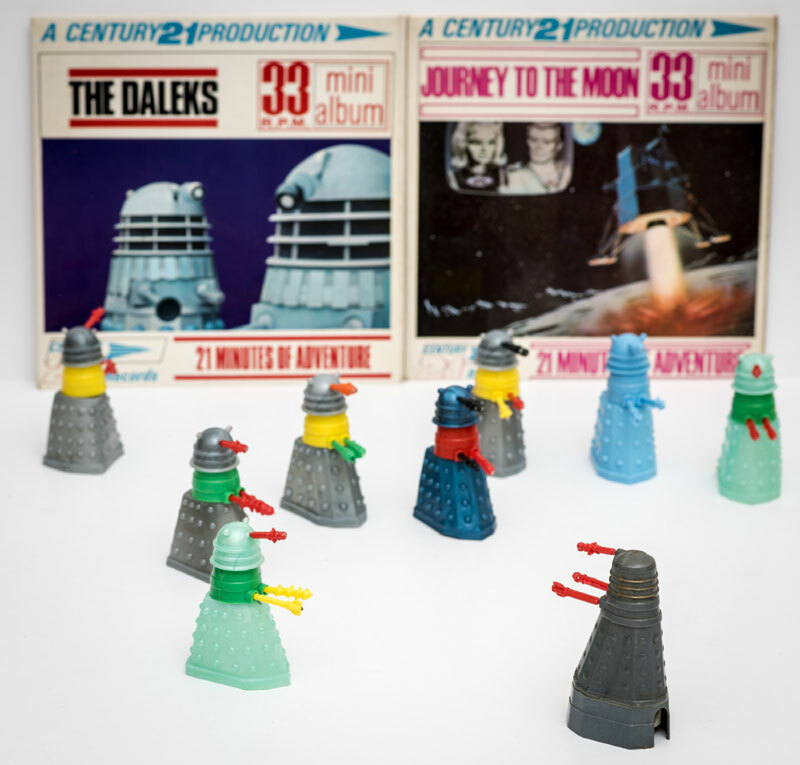 The Daleks continue to dominate along with a rare model Pencil Sharpener from 1965 and with 2 EPs supplying mood music this Dalek diorama demanded £330. 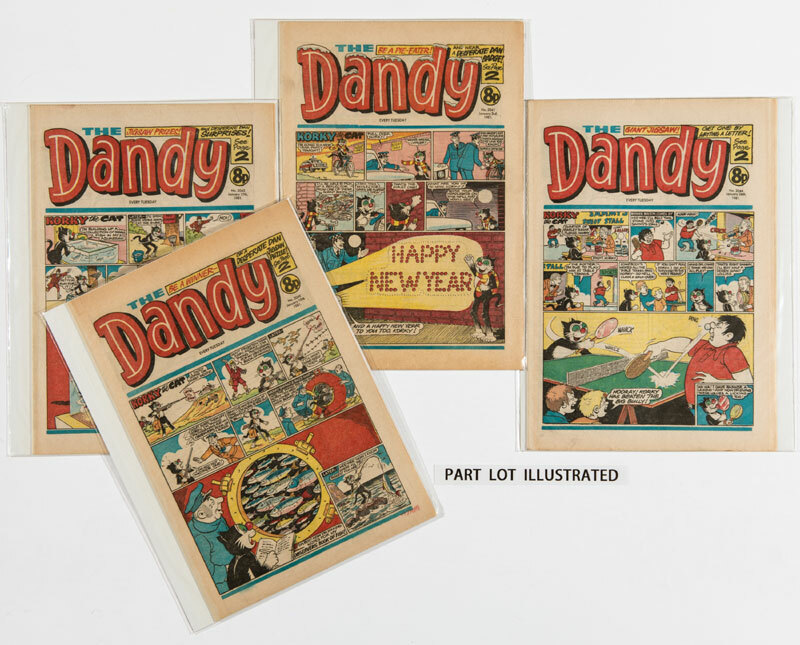 The Dandy complete year of 1964 was offered in mid grades and delivered £270. Diana stars, Jane - Model Miss and Wynne against the Beatniks made £2 each. But there were 73 big issues. Heavy, man. 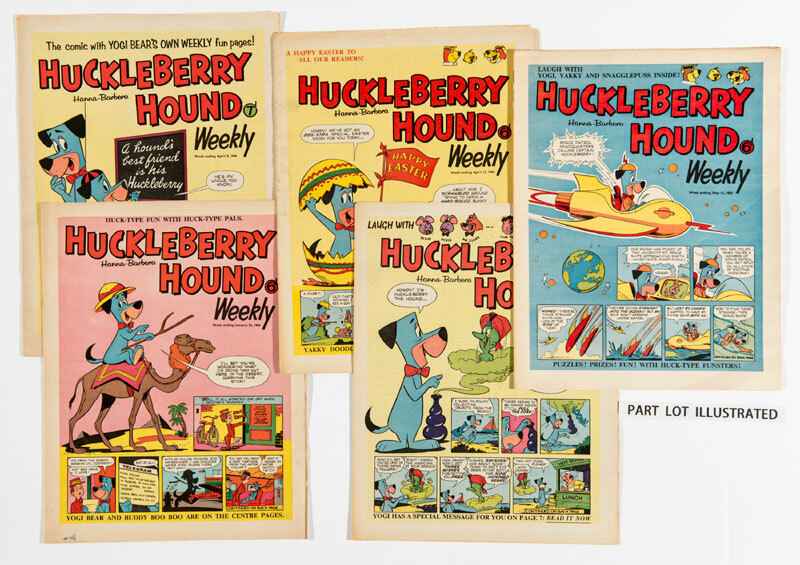 Huckleberry Hound was nowhere near the doghouse with £340 for 72 issues. Even dressed up as a wee lassie to escape big bully, Napper McKay, didn’t stop Oor Wullie from a man-sized £680. Tiger and Hurricane were in strong demand and their 1964 half-year bound volumes stormed to £360. 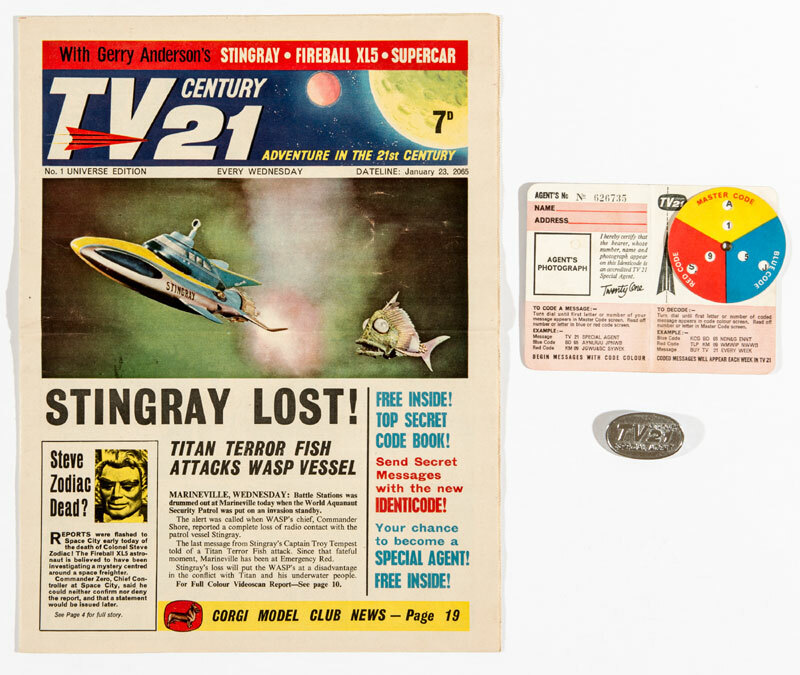 This TV Century 21 No1 with free gifts from 1 and 2 was in particularly good condition with light horizontal mail fold. £580 unfolded. 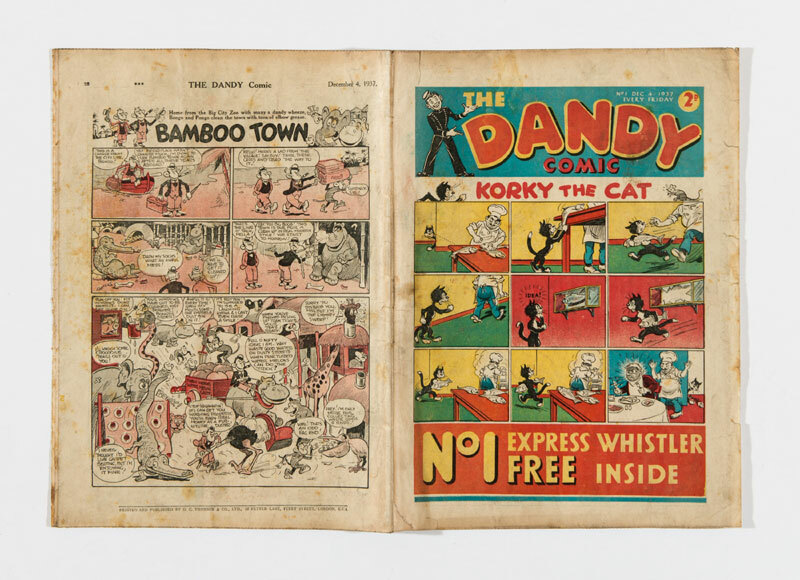 Complete [vfn/nm] years of Dandy from 1981 (illustrated above), 1982, 1983 and 1984 were all won by the same bidder for a total of £280 and are on their way to him in Mumbai. He’ll now have plenty to read during the rainy season. His brilliant letter to us is the centre piece of our final story. Our US section was a complete sell-out and some highlights are featured below:. 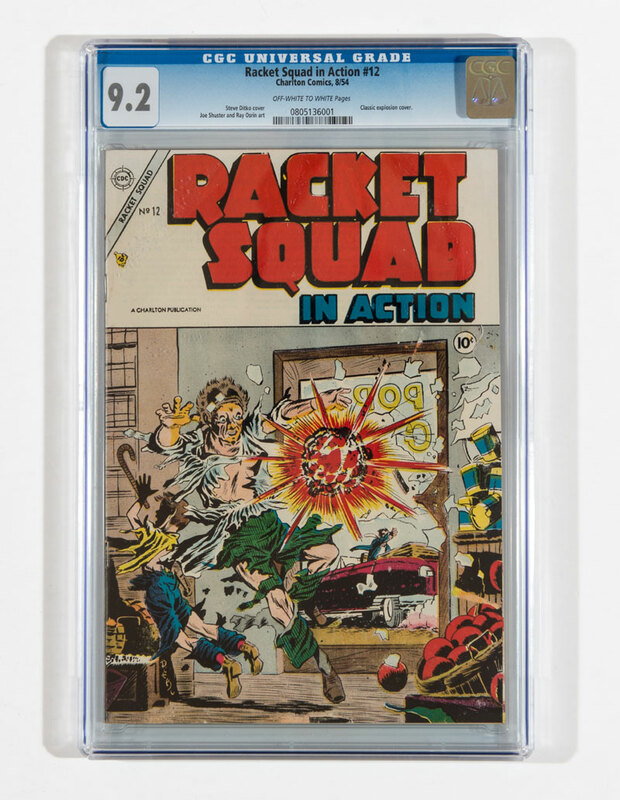 Racket Squad In Action #12 from 1954 is a Charlton publication that featured a Ditko classic explosion cover. CGCd at 9.2, the highest grade for this particular issue, it detonated £270. 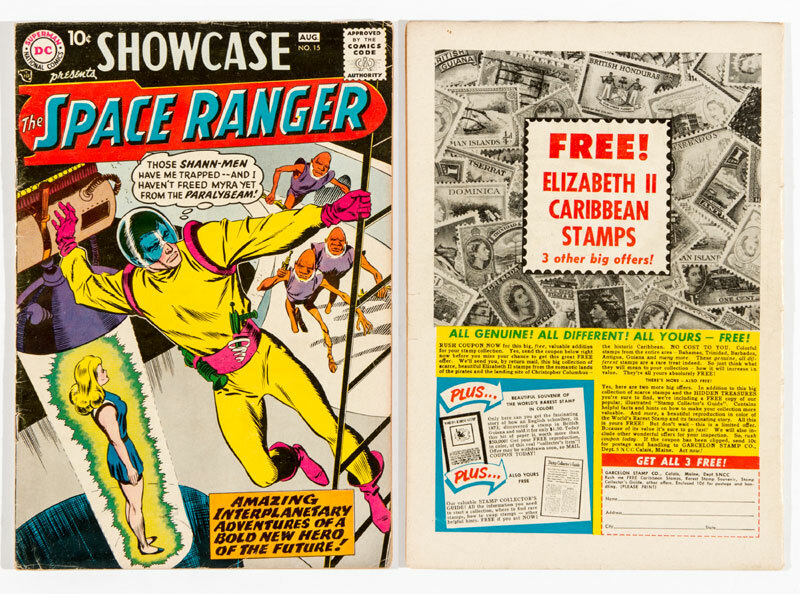 Although in mid grade [vg+] Showcase #15 in not easy to find and £145 was paid for the first Space Ranger. 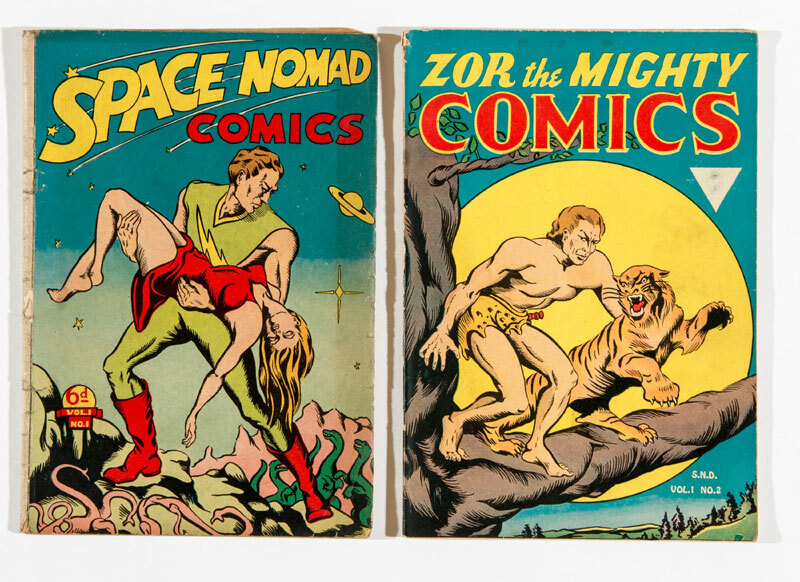 Space Nomad #1 is a Canadian edition rarity and teamed with Zor The Mighty 2, £135 took away these two Century publication issues. 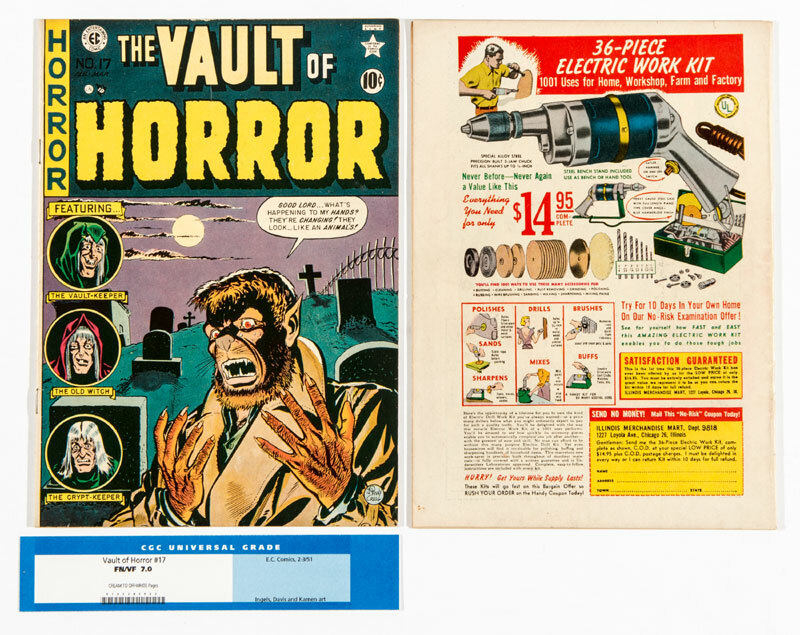 Our run of EC comics continue to attract firm bidding and Vault Of Horror #17, originally in CGC 7.0, vaulted to £260. 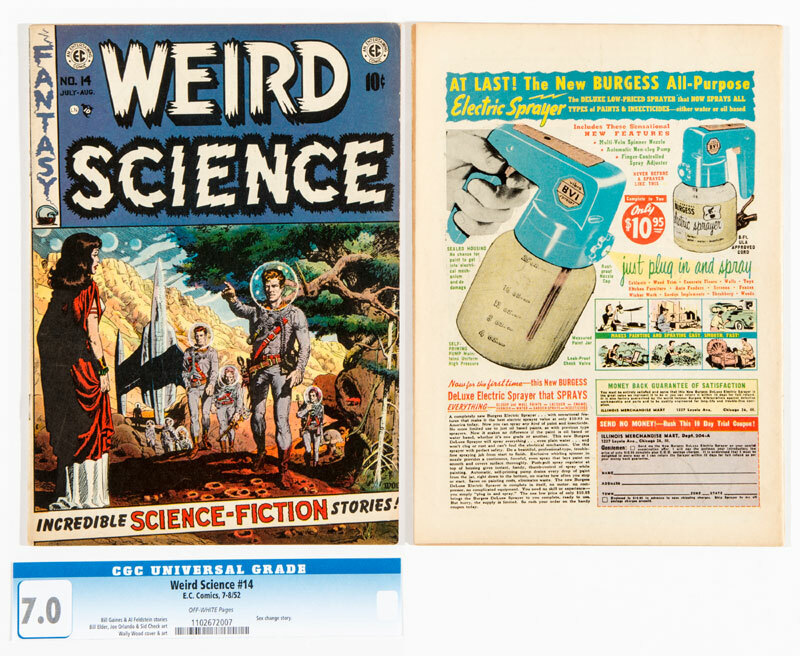 Weird Science #12 from 1950 is actually #1 and with a high CGC grade of 8.5 it bubbled up to £880. 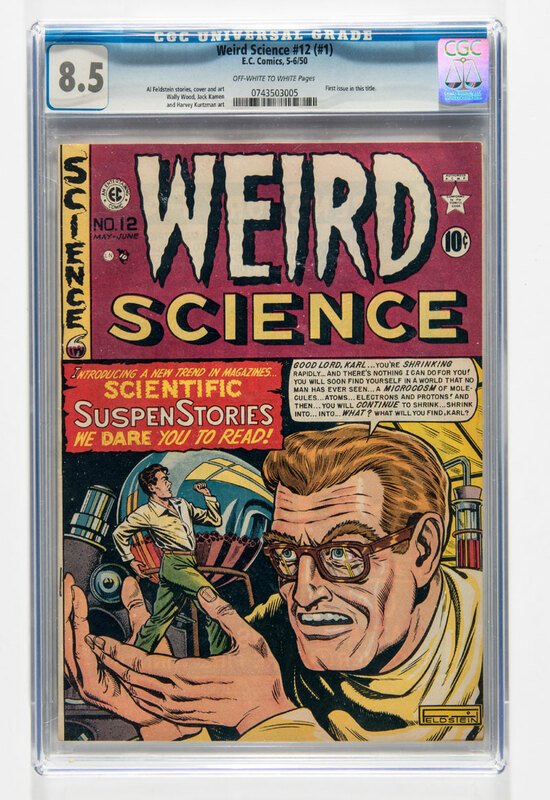 Weird Science #14 (#3) was also in demand and this CGC 5.5 copy reached a strong £250. 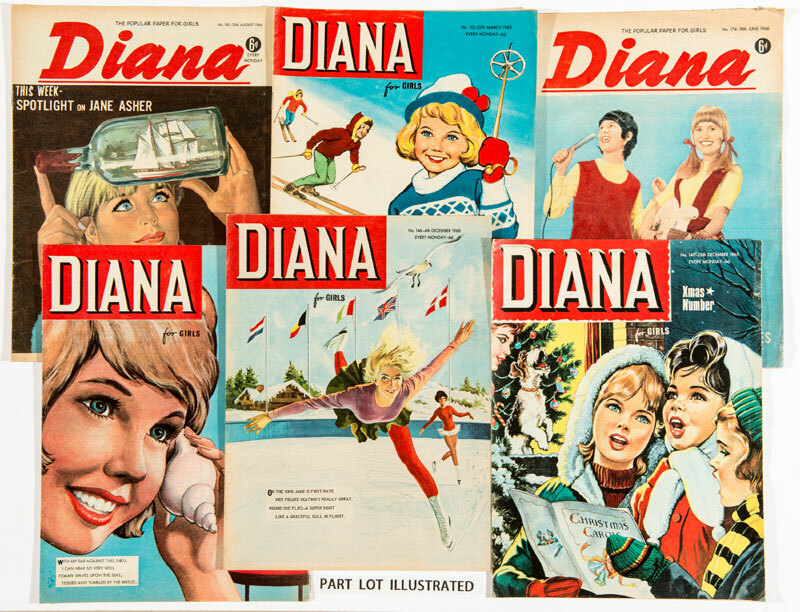 On a lighter note our collection of glamour magazines continue to attract attention and 3 copies of Whisper from 1950 with Peter Driben cover art keyholed £75. 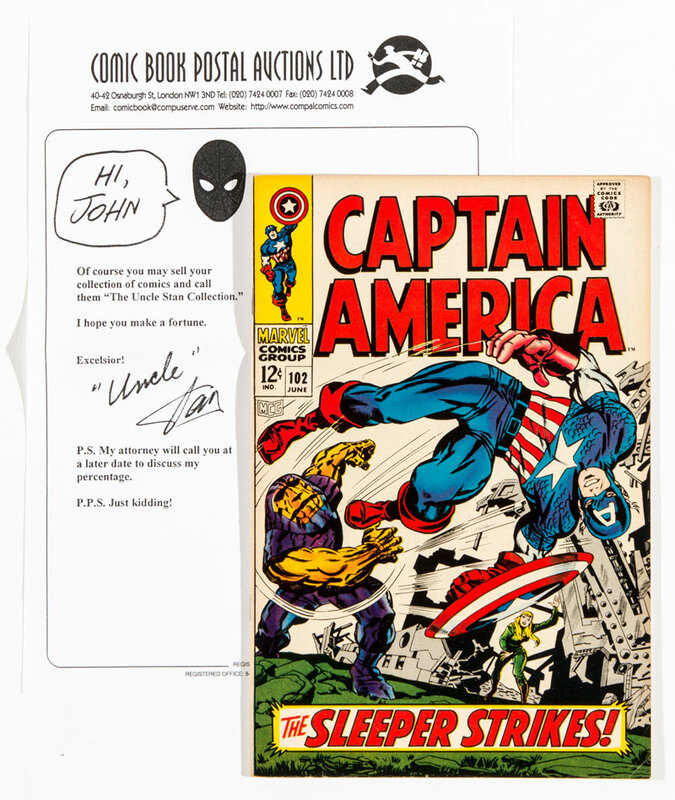 This copy of Captain America #103 is from the ‘Uncle Stan’ collection, sent by Stan Lee to his nephew, John, in London in 1968. It sold for £65. 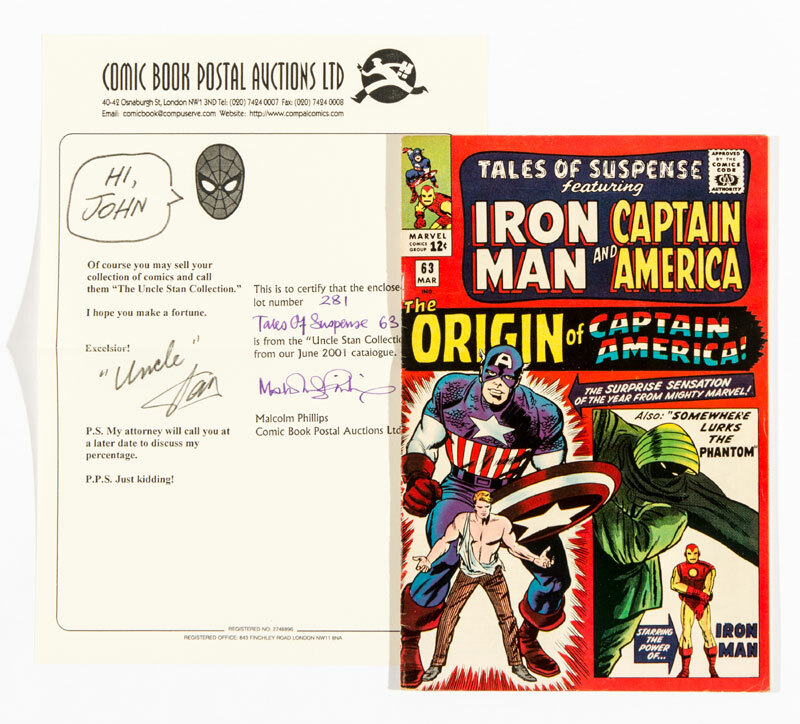 From the same ‘Uncle Stan’ collection, Tales Of Suspense #63 heralded the origin of Captain America and made a strong £150. 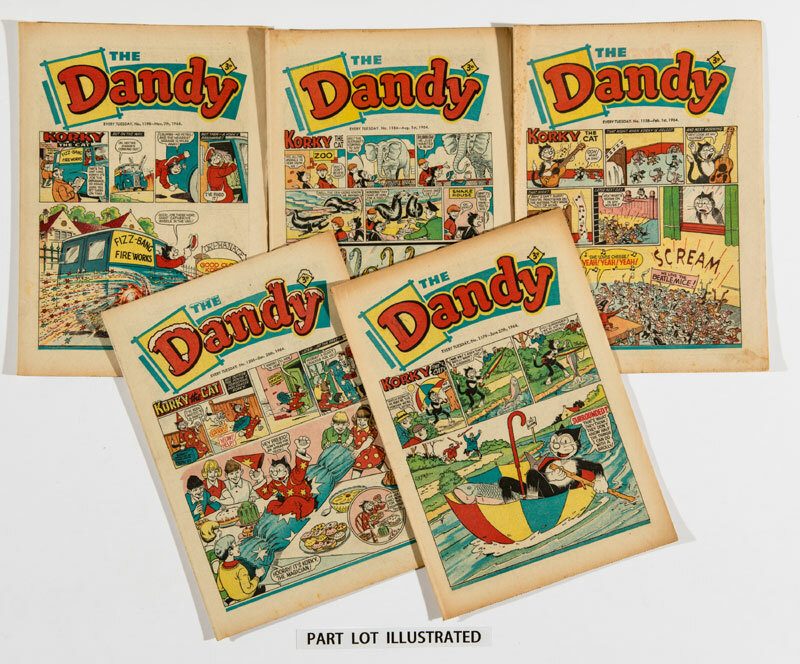 I merely wish to confirm that I’d bid successfully for the four years of Dandy comics in your timed auction which closed today. I’ve not received any intimation to that effect, suspense building on whether I’ve unwittingly violated some protocol, and hence earned the Auctioneer’s wrath. I presume that payment for my purchases (hopefully not imagined) will be charged to my credit card, details of which I had to furnish before being allowed to bid at your auction. I also hope that that mailing all those Dandys to India will be as nonchalant a task as you implied in my earlier telephone call to you. As you suggested, they might be packed without individual backing boards but definitely with their plastic slip sleeves, thus encased individually and separately each issue. May I formally request your esteemed assistance on this matter? Payment for their pristine despatch will be made by my credit card. Condition of receipt, of course, is subject to the paladins of the Indian Customs. And finally, if your surname is Phillips, I acknowledge I’m dealing with a fearful celebrity, wisdom dawning on me after I read through your own webpage, as well as Comic Book Price Guide UK’s unreserved, well-deserved gushings over your single-handed, market-making efforts for The Beano (particularly). So if you’re the bloke who has made comics a dozen times costlier over the last decade for miserable amateurs – troglodyte readers with shallow pockets - like me, thank you for opening my eyes even more agape to the ravages of fell inflation. Life’s tough in India for those who are not arseholes, Malcolm, as you must have fathomed during your recent holiday out here. You must have been all impressed by our grand nation on the march, every soul striving to hustle, to earn a not-so-mighty rupee, and forgetting all the fabled courtliness and hospitality. If there was anything deplorable, blame the cockiness Gandhi wrought on the rabble. His personal motto: ‘One may scurry, but never curry’. So let me light the lamp of Reason, and acknowledge that a Sahib is always Sahib, even when Independence has robbed the natives of all their manners. I hope you returned to Blighty will all illusions and orifices intact, and have resumed your trade more invigorated. We attach invoice details of your success with the Dandys, all backing boards will be removed and your parcel sent in a week or so. We had a wonderful time in India and look forward to your future business. My orifices are indeed intact. Who says the art of letter writing is dead?